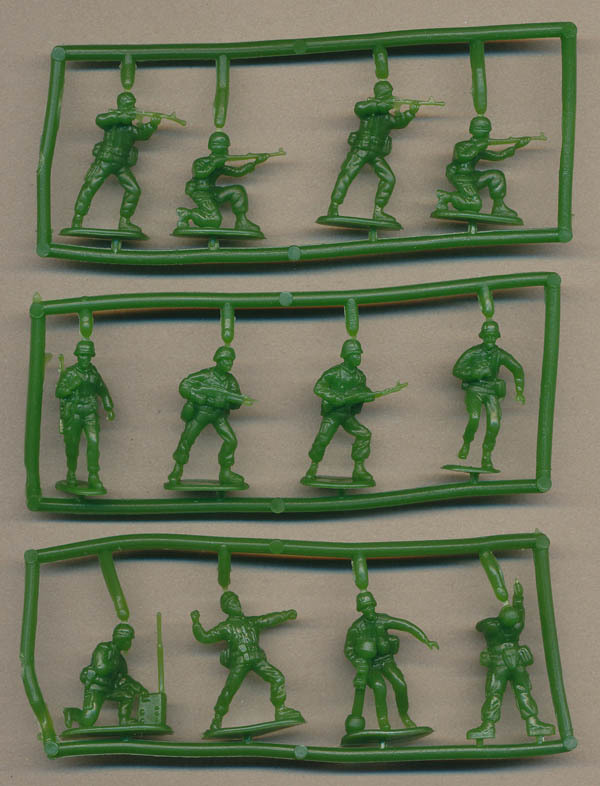 These are of course toys, and not intended to depict any particular unit or nationality, but rather generic modern infantry for the late 1990s. All wear trousers with cargo, hip and rear pockets, along with short boots. Some look like they wear just a shirt, but it seems likely they are all supposed to be wearing a jacket, but this is extremely short and barely appearing below the waist belt on many. Although also very hard to see, it looks like every man wears something like the PASGT body armour, and all have a covered helmet which broadly follows the usual shape of helmets in most armies of the time. Kit varies a bit in location but is one or two pouches, a triangular bit in the middle of the back that looks like the plastic carrying case for the American three-folding shovel, and a water bottle. They have braces over the shoulders that meet at the back, then part again before joining the belt. It all looks like an approximation of the American ALICE system which was widely worn at the time, so it seems likely that the US infantryman was the inspiration for their design, although of course sources may have been many. Weapons are very vague and have almost no detail. The stand-out weapon is that being carried (or is it dragged?) by the second figure in the second row, which resembles the M47 Dragon anti armour weapon, again current at the time. Next to that man is a prone soldier who is armed with possibly the smallest weapon imaginable. Presumably this is an officer, and presumably he is supposed to be holding a pistol, but it looks more like the 'Noisy Cricket' issued to Agent J in Men In Black (1997). The sculpting is not particularly great, with a lot of lost detail and definition, while the faces are sometimes so low in features that they look like they are wearing face masks. The figures are made in a very bendable PVC, so even very thin items such as rifle barrels and the radio antenna resist breaking and cheerfully resume their proper shape even after extreme bending. The general look of the figures is nice and slim, and on our example we found no flash or excess plastic. The poses range from respectable to poor. The prone man looks a bit pathetic with his 'weapon', and the man dragging the anti-armour weapon is also far from ideal. The man holding binoculars is probably supposed to be another officer, but where is his weapon? Nevertheless many of the poses are quite good and lively too. Unlike the soft bendy figures, the accessories were made in quite a hard plastic and are pictured below. 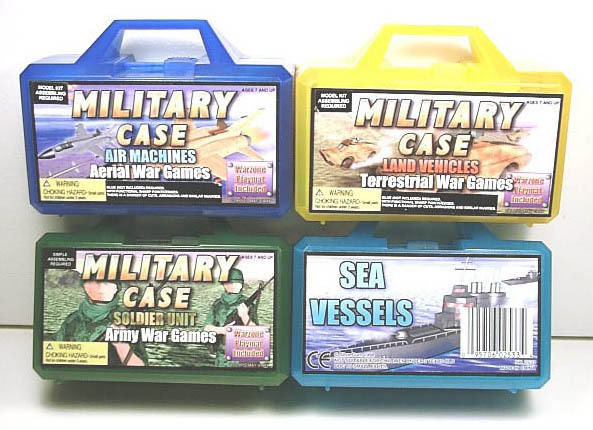 They are a generic but still useful collection of brick walls, sandbag emplacements, street furniture, tank traps and smaller accessories, and nicely made. As we have said, these are only meant to be toys, and never intended to be scrutinised like this, so we are being very unfair in giving them the full treatment. However it is safe to say that these are generic and reasonably good looking infantry soldiers from around the late 1990s, and for those interested in this period they may well serve a useful purpose as there is little enough else to choose from. 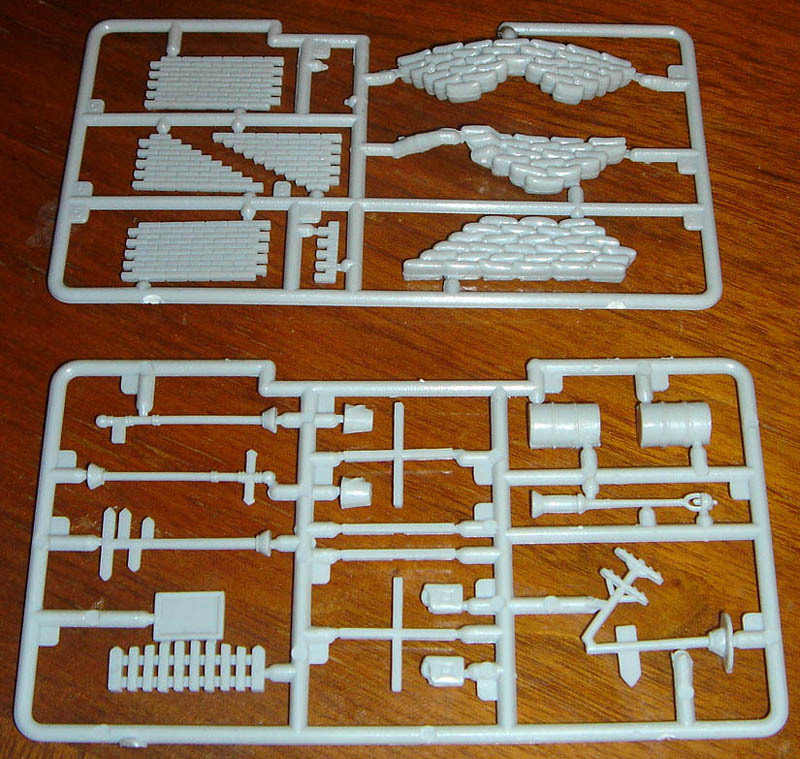 The figures on sprue are shown below. These products have been discontinued for a number of years and so are not particularly easy to find today.